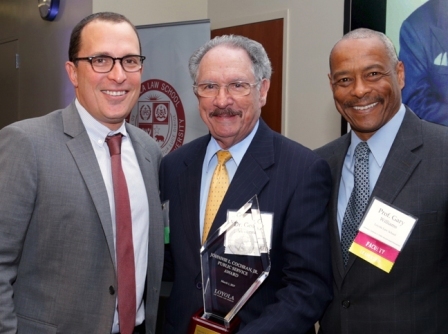 Attorneys, judges and friends gathered at Loyola Law School, Los Angeles on Wednesday, March 1, 2017 as it honored Los Angeles Unified School District Board Member Dr. George J. McKenna III with its Johnnie L. Cochran Jr. Public Service Award at a ceremony and reception held on Loyola’s downtown L.A. campus. The Cochran Award is presented annually to an individual who embodies the qualities of Loyola alumnus Johnnie L. Cochran Jr. '62, who was known as a trailblazer, innovator, master attorney and mentor. Mrs. Dale Mason Cochran, his widow, and Loyola Dean Michael Waterstone will present the award. Proceeds from the event benefit Loyola’s African American Scholarship Fund.